The girls began their week dancing their hearts out during Wake Up Shake Up in the big yard and the fun continued all the way to Friday! We enjoyed loads of activities including Tag Rugby, Cricket, Badminton (thanks Ms Reilly! 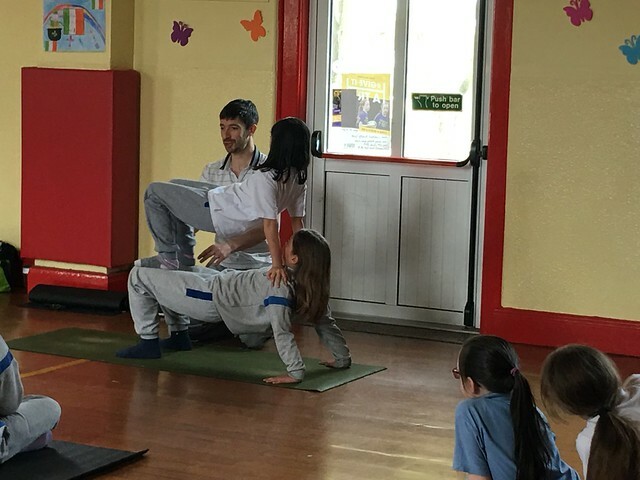 ), Playground games with Grandparents, a Skipathon, Yoga Óga and Irish dancing. The students and teachers worked very hard at staying active all week and the weather thankfully stayed on our side! Third classes were very lucky to have a visit by local potter; Elaine Fallon from Brookwood Pottery. It was a unique opportunity for the children to learn about the process of making pottery. They asked the artist lots of questions and some children said they'd like to be a potter in the future! Elaine brought in some of her beautiful pieces which the children got to hold and admire. 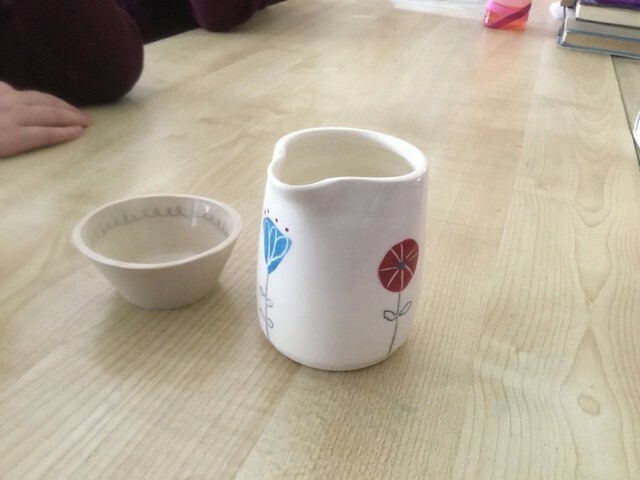 Subsequently the children made their own clay pots and Elaine gave the children useful practical advise for moulding the pots successfully during her visit. The children marked Celtic designs on their pots as we were learning about the Celts in history. Finally they painted them in the colours of their choice. The children did a great job. 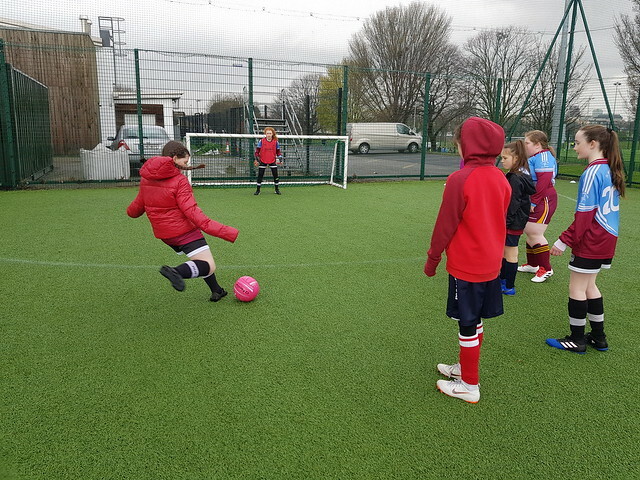 Girls from 3rd-6th classes played in the Spar 5's Soccer tournament on Friday April 5th. We played 9 matches, against schools from all over Dublin, and won 6 of them. We were knocked out of the semi finals by a super talented team from Tallaght. Huge thanks to our coach Noel Corr and to Ms Flynn for managing on the day. Girls in sixth class enjoyed flower arranging for Mothers Day. Huge thank you to Catherine and Mary for organising. 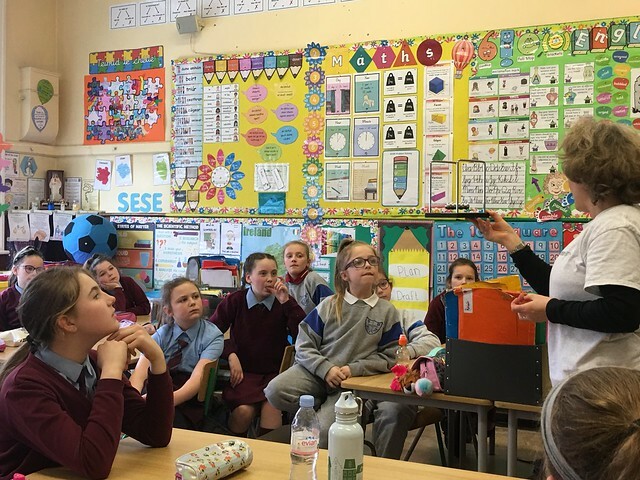 The girls in Senior Infants, 2nd Class and 4th Class got the opportunity to take part in an SEAI workshop where they explored the topic of energy and sustainability in a fun and engaging way. Senior Infants got to meet GUZZLER the puppet who loves to waste energy. Through a series of games and activities they learned where our energy comes from. They also learned about the importance of saving energy and how we can make simple changes to help save our environment. The science of energy and climate change. It was great fun !! 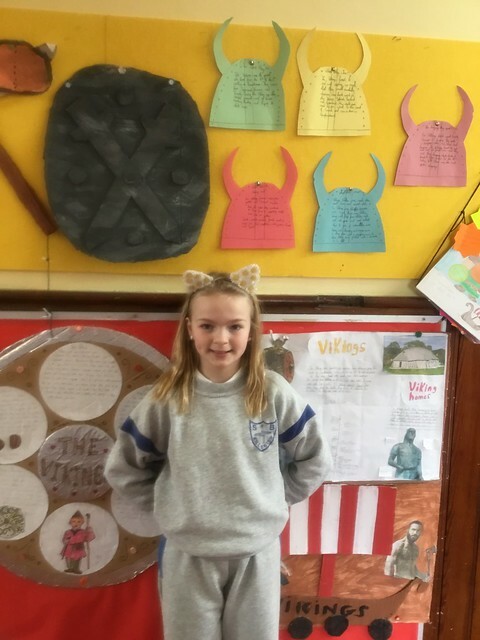 Ms Delany's 4th Class did fantastic work on their Viking Projects! Deck the Halls in 5th class! Snow much Fun in 1st class!! Halloween performance by 2nd classes! Dublin Zoo visits our school! Infants on an Easter Egg Hunt! Class news from Junior Infants! Class news from Ms.Flynn's 1st class! 4th class participate in the RDS Primary Science Fair! 3rd class visit our local Super Valu! Choir record a Christmas Album! Our green team plant lots of trees! 5th class bring Hogwarts to St.Brigid's! Past pupils artwork feature in an Irish movie! The Lifecycle of a Butterfly in 2nd Class! Mad Hair Day & Ice-Cream! Fun Word Hunt for 2nd & 3rd classes! 2nd class learn about different countries! Father's Day Art and Crafts! Spaghetti Tower Marshmallow Challenge in 6th Class! Student Teacher Penalty Shoot Out! 3rd Class learn about France! Travel & transport in Infants! 4th Class get stuck in the mud! 5th Class enjoy Dublin Hop On Hop off Bus Tour! Scoilnet Star Site Award for our school website! Infants enjoy an Easter Egg Hunt! 2nd classes have an Easter Egg Hunt! 2nd Class Mother's Day Art &Fun in the Sun! 6th & 1st Classes enjoy Paired Reading! 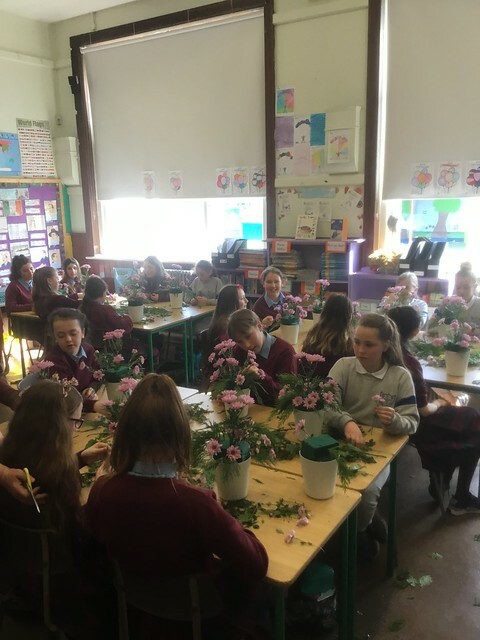 Flower Arranging in 6th Class! Seachtain na nGaeilge sa Scoil! 5th Class Sow & Grow! Junior & Senior Infants on Tour! 5th Class Present their Projects on the Continents! Workshops with Graffiti Classics String Quartet! 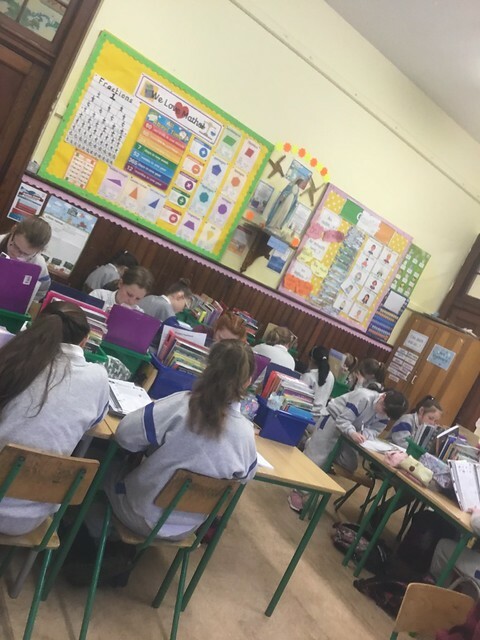 6th Class complete a marathon! Static Electricity in 2nd Class! Intel Mini Scientist National Finals! A visit from Sam Maguire ! Our Mini-Scientists are through to National Finals! Christmas Jumper Day in aid of LauraLynn & a special visit from RTE! Pointillism in Ms.Flynn's 1st class! Ms.O'Donovan's class perform a flashmob dance! Third Classes are learning to play the Recorder!